Last night I was talking comic books with a comedian at the Comedy Cellar and he asked me to explain the difference between scripting comics versus movies. After I’d explained it to him it dawned on me that I had blogged about this very subject a few years ago. So I’m dusting off this blog from July 2009 to share my experience in scripting comic books. In an earlier blog I’d mentioned moving to Atlanta with a, rather lengthy, script for my first issue. I’m not embarrassed to say that it was not a proper script for a comic book. In fact it read very much like a Hollywood movie script. However, unlike the movie industry, there is no industry standard format for scripting comic books. One method is plot-art-dialogue, sometimes referred to as the “Marvel Method”, in which a writer presents the artist with a plot synopsis to work from. This gives the artist more control over the pacing and structure of the story. Then there’s the full-script method which is…well it’s exactly as it sounds. A script where the writer assumes all control over the story, pace, dialogue, etc. Full script is my preferred method and it’s how all five issues of The Deciders is written. Enough with the history lesson already! What is your point? My point? Hmmmm…I don’t have a point per say but more of an observation. Below are just the two pages of my script for issue one accompanied by the finished artwork. I thought it was perfect, from the pace of the story right down to the dialogue. However, when my artist,Kevin Stokes, handed back the finished pages…I quickly changed my tune. There were a lot more changes in dialogue and pacing by the time we got the first 5 pages finished for the preview issue. 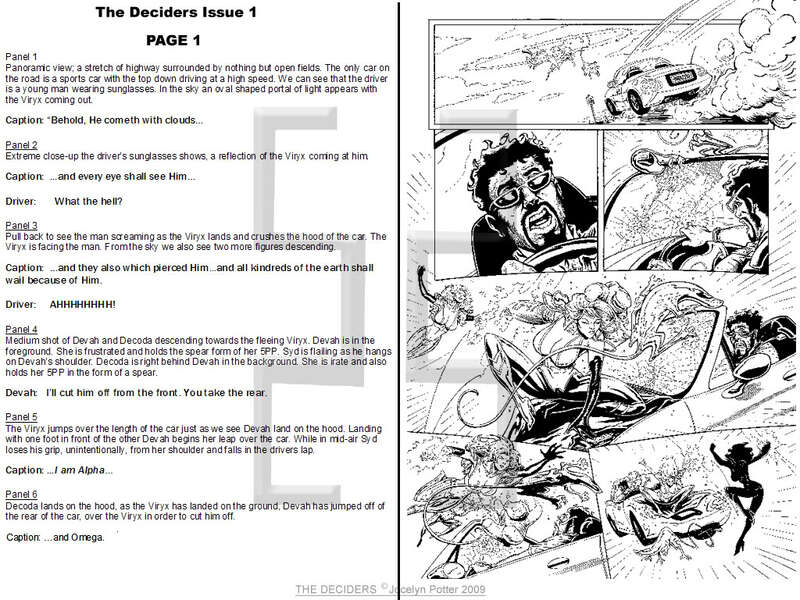 Check out The Deciders Preview Edition. In the end, I realized that working full script may give the writer all the control… but it certainly doesn’t mean there is no room for improvement by the artist.